All passengers should be aware of a slight delay on either Vietnam or Cambodian side of the border. Normally a crossing takes about 2 – 3 hours; it can be longer if a passenger’s visa application is not written out correctly. Jahan Passengers do not have to disembark. Though the Jahan cruise ship remains still, life on-board goes on uninterrupted. A printed daily program for the following day will be placed in your cabin during dinner. We have a turndown service every evening. Please keep observing the notice board for any changes to the schedule, and also be aware of our daily cruise briefings. Two round pin type, same as in Continental Europe can be used on Jahan Cruise. Various adaptors for different types of plugs are available at the reception. The electricity supply is 240V. Please turn your lights off when you leave your cabin. When mooring, you are welcome to leave and return to the ship as many times as you wish. Our next sailing time will be displayed on the daily schedule and passengers are requested to remember this before disembarkation. Group shore excursions are organized by the Jahan Cruise director. Meeting point for the excursion is the Lounge. You will be accompanied by an English speaking tour guide on all your excursions. Five minutes prior to casting off, our captain will sound the ship’s horn three times to remind you to return to the ship. Passengers are encouraged to sign out on the special board; this way we ensure that we do not sail off without you. We suggest that if satisfied with the service a gratuity will be collected at the last day aboard Jahan Cruise. We give everybody, staff and crew an equal share and make sure that those in the kitchen or engine room all benefit as well. The amount would be at your discretion, but if an indication is required we suggest 8 USD per passenger per day. Gratuities shall be settled together with the shipboard account at the end of a cruise. Please note that you are under absolutely no obligation to make any gratuity at all. Our tour guides do not partake in the staff’s tips and you may tip the guides separately before the end of their tour. The Jahan guide services are conducted in English. Guides services in other languages are available at additional cost. The Jahan itinerary on our website is a general overview of the main ports of call. The itinerary can be changed as much of the tour depends on river conditions and other local factors. A daily schedule will be posted one day in advance. This schedule contains an informative fact sheet on the sites we intend to visit. Please be informed that announcements can only be heard in all public areas as well as on the outside decks. Announcements do not go reach your cabin. In case of an emergency you will hear a loud continuous blast through the ships horn. These vary depending on the season. In the dry season (December-April) the water level of the river will be quite low and in some places, the level would have dropped by more than 8 meters from its monsoon level (Jun-Sept). Though the river can be miles wide, channels may be narrow and hard to navigate. There is, thus, some risk of running aground on submerged sandbanks. Our captain will take every necessary precaution. In case of high seas or even in the Tonle Lake, the winds can be very strong. Changes to schedule may be made due to technical complications or unpredictable weather conditions. The Jahan Cruise Director will immediately inform you of the changes vis-à-vis or an announcement will be made via the public address system. Please also keep an eye on the notice board for any subsequent notice of any changes to planned events. Tourists are rarely the targets of theft in the countries in which we operate. When sailing, passengers tend to leave their cabin doors unlocked. Though a 24-hour security detail is assigned to the gangplank controlling access to the ship, we recommend that you keep your doors locked at night. All cabins have a combination type safe - please use a number you are familiar with. Jahan Cruise will not be held liable for any losses from the ship or whilst on an excursion ashore during a voyage. The main office is at the Lobby Lounge. The Jahan Cruise Director or his/her assistant will be on duty from 6.30h until 24.00h. The sun can be powerful. Please be careful and always wear sun block during the day. Vietnam and Cambodia are 6 hours ahead of Greenwich Mean Time (GMT). In winter, please add 1 hour. The ship’s water is cleaned through a filtration system and the water is suitable for washing and brushing teeth but should not be drunk. Complimentary water is available in your Jahan cabin. Tap water is not safe, although the water is purified (Sand filtration, Reverse Osmosis, UV and Active Carbon). We have a central boiler system in place; please wait for a short while for the heater to heat up the water. 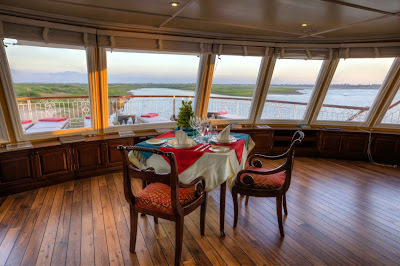 the Jahan provides a luxurious looking glass into the beauty of Cambodia and Vietnam. The Jahan was built in 2011 and ushered in an era of opulent cruising. Aboard, guests are treated to grand staterooms, elegant public areas and all the five-star services of the finest hotel. The cutting-edge Scenic 'Space-Ships' offer the ultimate in all-inclusive luxury river cruising. Explore the waterways of the Mekong River in unmatched comfort.